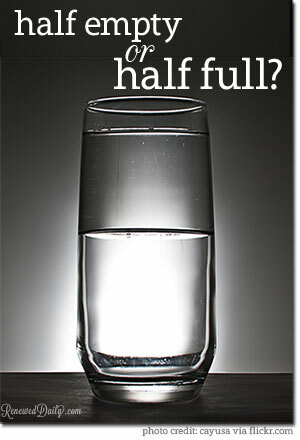 Is the glass half-full or half-empty? Silly question, right? But it really is all about perspective, and this question can tell you a lot about a person's mindset. A pessimist would say that the glass is half-empty. A pessimist looks at this difficult life as a losing battle, one in which we are ill-equipped from the start. A pessimist sees defeat around every corner and the gray in the cloud that holds the silver lining. And he's right. An optimist would say that the glass is half-full. An optimist looks at this difficult life as a chance to succeed in a challenging situation, one in which we can remake ourselves in order to prevail. An optimist sees a win just around every next corner, and the silver lining is so bright, she's gotta wear shades. And she's right. A realist, well, that's really just a pessimist wrapped in the cloak of an optimist, isn't it? A realist longs to be hopeful, but is scared to really take that leap. A realist tries to keep the faith, but never really goes all-in. A realist sees the silver lining, but is cautiously optimistic because of the threatening gray in those clouds. And he's right. I like to define myself with the fourth option. I know, I know... you've never heard of a fourth option. That's how the enemy likes it! He doesn't want you to know there is another way to look at life. He tries to keep this fourth option hidden and secret, but today I'm throwing open the doors and letting the light in! I am a Sovereignist. A Sovereignist is all three of these rolled into one, with God over it all. I am part pessimist because this life is a losing battle we are ill-equipped for from the start. I embrace a little optimist because the silver lining does outshine the gray. And the realist in me recognizes that it is risky to put all your faith into something that may soon be dashed. As a Sovereignist, I recognize that none of these labels quite fit because we are not defined by earthly terms. We are not weighed down by physical challenges. We are not left to our own devices. With Christ as our Savior, the war is already won.... each and every battle we face on this earth is merely a distraction meant to discourage. Through Christ we are fully-equipped for each challenge. Through Jesus, we have a champion who walks onto that battlefield on our behalf. And He never loses. My clouds... pffftt, what clouds? I don't even need a silver lining! God keeps my blue skies clear and bright. It's only when I begin to focus on the weather that those clouds seem to roll on in. Because I've taken my eyes off the Sun. Does life as a Sovereignist mean that life is rosy? Um, no! But God is rosy. Does it mean that I never face trouble or sorrow? Uh, again, no! But God faces it with me. Will this new outlook wash all my cares away? You guessed it, another no! But Christ washed my sin away, and that is the only care that matters. Will you join me in becoming a Sovereignist today? Let's begin to look at this crazy life through the eyes that see the truth. This world is not our home. There is no glass. (a nod to my Matrix friends on that one) And I serve the One who can keep the water coming. So no more arguing over whether the glass is full or empty. Just drink up!! ← Which Came First, the Faith or the Evidence? "With Christ as our Savior, the war is already won..." Yes, yes, yes!! Enjoyed your post, Shelly! We need to remind ourselves every day that the war is won and walk in the redemption Christ has secured for us. Thanks for linking up to Testimony Tuesday. I agree you don't need to look for a silver lining when the sky you are looking at is already beautiful no matter the weather. 🙂 This is a great post, and it's got a fun tone right along with the serious message. Very nice! Ahhhh, Shelly, SO glad and grateful that your beautiful blog offers us options to partake of your many wonderful writings whenever we need! Today I'm blessed with two posts that speak especially to my heart! Absolutely. . .I'm joining you as a Sovereignist today! Ours Sovereign Lord reigns and holds us firmly in His mighty grip and the shelter of His wings! Bountiful blessings and beauty be yours, precious sister in Christ!